If you’re a Formula 1 auto race fan, you know the annual race in Monte Carlo is the grande dame of speed and glamour. My husband Bill loves fast cars and is especially enamored of the Ferraris, though this year they are thoroughly outmatched by the Mercedes. When we learned of the Azamara Quest’s 4 night cruise which culminated in attending the race, we had to do it! I’ve got to say this was the experience of a lifetime. Unpack once on board, spend lazy days on the French and Italian Riviera, and then enjoy the adrenalin pumping race among the rich and famous in Monte Carlo – hassle free! 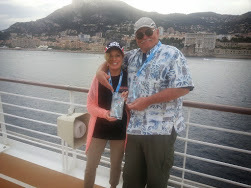 We anchored out, overlooking Monte Carlo and the steep cliffs of Monaco, then took a tender in to the pier. Walk up the hill, say howdy to the royals in the palace on top of the cliff, and find your seat. Bill opted for seats that overlooked the action in the pits, right in front of the S-turn. The cars, drivers, and pit crew were so close you could almost touch them. After the race, you have the option to stay and party with the population (ranging from die-hard race fans sporting Indianapolis 500 t-shirts or Ferrari caps to glamorous women in form-fitting outfits) or return to the ship to enjoy a relaxed evening. Strolling along the Promenade des Anglais overlooking the Cote D’Azur in Nice. Ok, we had to duck for cover during a brief hailstorm but after that, the skies cleared and it was beautiful. We enjoyed a traditional nicoise salad paired with a lovely Provence Rosé at a sidewalk café, enduring the stares of locals since we chowed down much earlier than is proper in France. 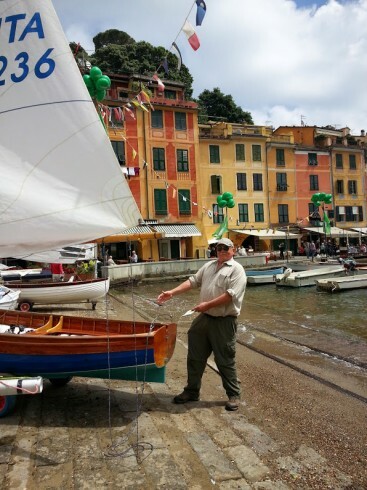 Enjoying a regatta off the harbor of Portofino. Bill loved the little wooden dinghies. We found a great viewing area up the steep hill of Portofino. Yachts, helicopters and cigarette boats. I’m a small town girl and I was wowed by the huge yachts with a minimum of one helicopter and fast expensive boats streaking across the water. It was fun to discover an app to learn the ownership of the yachts we saw along the way. I can dream …. 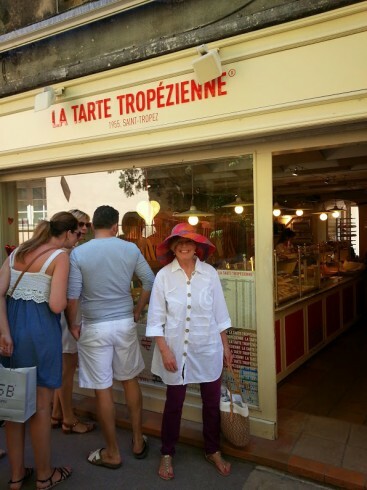 Finding the traditional tarte Tropezienne in St. Tropez. Apparently, La Tarte Tropezienne does not want out of towners to find the bakery so there will be more for the locals of this delicious cake (think brioche dough with a creamy filling and sprinkled with a bit of salt on top – yummy!) Fortunately we ran into a lovely French family who led us through the narrow winding streets right to the door of the bakery which bears this cake’s name. Dinner at the Aqualina restaurant overlooking St. Tropez on board the Azamara Quest. Azamara cruises are inclusive – wine, beer, and standard brand liquors, gratuities – specialty restaurants (Prime and Aqualina) have just a $25/passenger up charge – but be prepared to enjoy a 4-star meal with incredible views and service. All the meals were great with 24/7 room service available if you want to laze in your cabin. The ship itself carries about 700 passengers, and though this cruise was fully booked with race enthusiasts, it never felt crowded. I’m anxious to try some of Azamara’s other itineraries – they’re port-intensive and focus on destinations the larger ships can’t get to. I know I’ll be pampered and relaxed – since Bill picked his passion of racing, maybe I can select the next one – wine-themed cruise in Australia and New Zealand perhaps? Or Greece and Turkey? Here at Bay World Travel, we’re here to book your dream vacation. I can honestly say dreams can come true!